The Presentation Series hosts artists’ talks, book launches, author readings, performances, independent film showings, panel discussions and more. The Series is dedicated to an exchange of ideas concerning the contemporary arts, as well as the communities from which the art appears and the communities the art is intended to reach. Upcoming events are posted on the home page of the website (Click here). Tracy Valcourt lives and works in Montreal, where she is currently a Doctoral candidate and lecturer in art and writing at Concordia University. Valcourt also has a long-time connection to the Kootenays, where she studied writing and sculpture at Kootenay School of Art. Valcourt has written reviews and feature articles for Border Crossings Magazine since 2005 and is working on a chapter for a book, Artistic Approaches to Cultural Mapping, with Dr. Sebastian Caquard. As part of her visit to Nelson, Valcourt will give a talk on her Doctoral work which investigates perceptions of landscape from an aerial perspective. To See or Not to See is a unique one-woman performance by writer and theatre artist Ruth Bieber. This play is a powerful story of wounding, overcoming, courage, and healing. Employing the circular motif of a shamanic quest as frame, Ruth Bieber’s first play is full of insight about what it’s like to have a vision disability as a child, a woman, a mother and a professional – and about the more hidden disabilities of those around her. Interdisciplinary artist prOphecy sun will accompany Bieber with an opening performance called Floating in the in-between, composed in response to Bieber’s story. 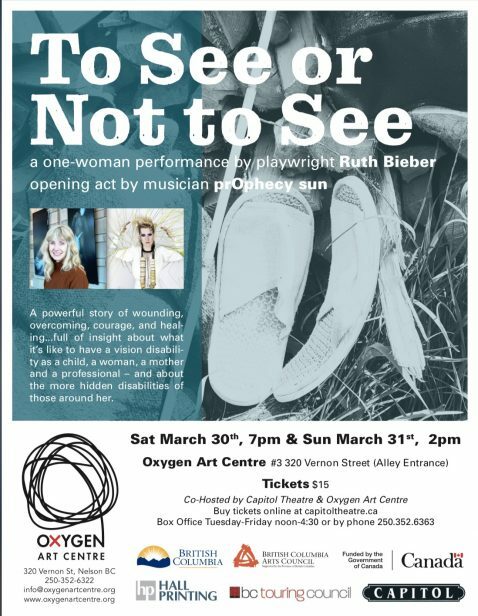 To See or Not to See is co-hosted by Oxygen Art Centre and the Capitol Theatre, and will take place at Oxygen Art Centre on Saturday March 30th at 7pm, and Sunday March 31st at 2pm. Floating in the in-between is an interdisciplinary performance by prOphecy sun made in response to Ruth Bieber’s powerful story To See or Not to See, 2019. The 15-minute piece conjures up images of fragmented, reflective still waters, woven together through an atmospheric composition consisting of looping, suspended textures, sounds, processed vocal tones, and field recordings. Complimenting the sound is a visual tapestry of projections.The multisensory piece elicits viewers to negotiate reality by transporting them elsewhere, into other places where the body, mind and subconscious moments meld together. 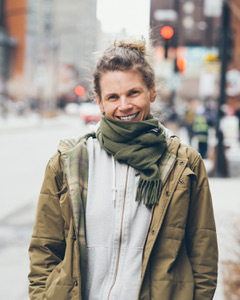 Ruth Bieber holds a MA in Education from the University of Calgary, with a specialization in Rehabilitation and Theatre. Prior to obtaining this degree, her professional focus was as a Counselling Therapist, working with clients with disabilities; often more than a single disability. In the early 1990s, she founded InsideOut Theatre which was a testament to the power of performance for people with a wide range of mixed abilities. Ruth is the recipient of the 2001 Mount Royal College Excellence in Teaching Award, 2003 Calgary Community Adult Living Teacher of the Year Award, 2004 Woman of Vision, 2006 Euclid Herie Leadership Award (CNIB), the 2008 Donald Norman Balancing Acts awards for achievements as artistic director of Inside Out Integrated Theatre Company, and the 2011 Spirit of Kelowna award for contribution to the Arts. prOphecy sun is an interdisciplinary performance artist. Her practice threads together both conscious and unconscious choreographies, sound, and environment to create exploratory works that invoke deep body memory. She self-releases music, choreography, compositions, and videos using smartphone technology. 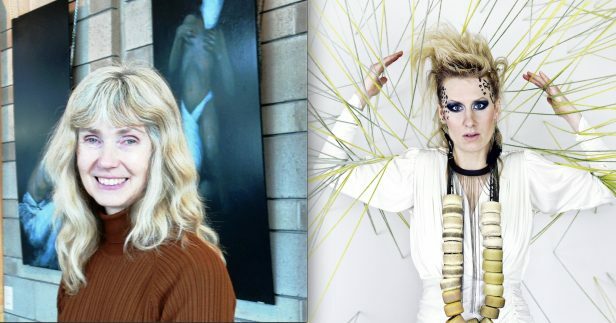 Current musical projects include prOphecy sun, Spell and the Vancouver Electronic Ensemble (VEE). Past projects include Tyranahorse, Her Jazz Noise Collective, Under the Sun, and The Adulthood. She has exhibited and performed at the Arts Commons, Orillia Museum of Art and History, Surrey Art Gallery, One Art Space, Dance in Vancouver, L’alternative: Festival de Cine Independiente de Barcelona, Festival Miden, Unit/Pitt Gallery, Institut für Alles Mögliche, Cinethesia Feminist Film Festival, VIVO Media Arts Centre, the Vancouver Art Gallery, Dancing on the Edge, Fontanelle Gallery, the Vancouver International Jazz Festival. She holds a BFA and MFA from Emily Carr University of Art + Design. 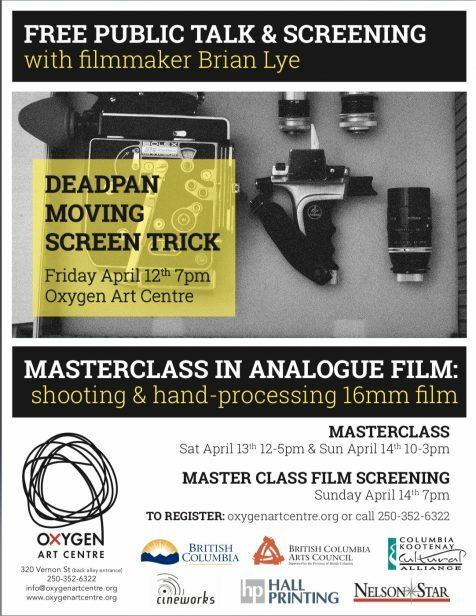 Join filmmaker Brian Lye at Oxygen Art Centre on Friday April 12th at 7pm for a public talk titled Deadpan Moving Screen Trick which will explore his adventurous forages into analogue filmmaking and processing, and his interests in early cinema, special effects, psychogeography, jokes and the everyday. Following this public presentation Brian will teach a weekend masterclass called Film Play: Shooting and Processing 16mm Film, which will run Saturday April 13 12-5pm, and Sunday April 14th 10-3pm. The masterclass teaches hands-on shooting and processing of 16mm film along with a film historical look at early cinema’s trick films, particularly the films of Georges Melies and the Lumiere Brothers from the late 1800s and early 1900s. Participants will shoot on a Bolex camera and process their film with Caffenol-C, a process using instant coffee, vitamin c, and washing soda. Brian Lye says: “Shooting and hand-processing film is literally a hands-on experience. We will load the film, wind the camera, mix our developer and process our film, all with our hands! It is a way to get tactile with moving image production.” This two-day workshop will be a practical, fun, and low-fi introduction to shooting and processing film. It is appropriate for youth and adults with varying experience in analogue film production. No previous training is necessary. Play and experimentation with the medium will be encouraged. Film processing by hand with Caffenol-C, a process using instant coffee, vitamin c, and washing soda. By the end of the weekend all participants will shoot their own 1-minute film, which they have processed by hand. Lye, having taught this process before, says “I’m excited to teach the masterclass because shooting motion-picture film on a Bolex is a rare and magical experience. At the end of the weekend, we will screen what we have made.” A group screening of the new films will be held on the Sunday evening, April 14th at 7pm at Oxygen Art Centre. 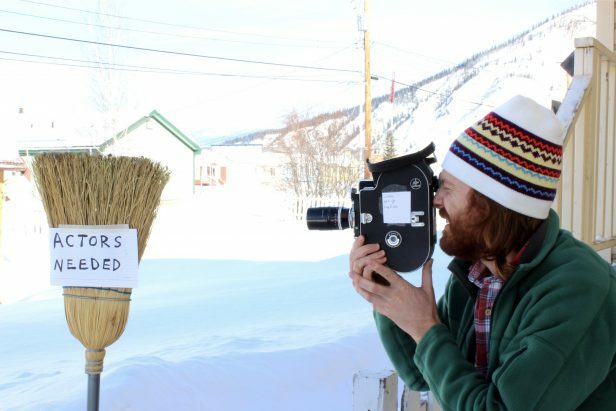 This masterclass is supported by the Columbia Kootenay Cultural Alliance, with In-kind Bolex rentals from Cineworks, Vancouver. Brian Lye is a filmmaker and artist who recently moved to Nelson from Vancouver. He enjoys collaboration, analogue film production, bricolage, and jokes. His research interests include early cinema, special effects, play, human/nature, cognitive development, psychogeography, and the everyday. Brian’s films have screened in festivals, galleries, and television networks such as Sundance Film Festival, Melbourne Film Festival, Canal+, SBS Television Australia, Images Festival Toronto, Vancouver International Film Festival, The Museum of Sydney, Centre of Contemporary Culture Barcelona, and others. He holds an MFA from the University of British Columbia (2018), a BA from the University of Victoria in Film Studies and Japanese Studies, a Diploma of Screen from Sydney Film School (2008), and was a guest student at the Film and TV School of the Academy of Performing Arts in Prague (2010).